why toastmasters executive committee?it is a question that let us know why we need an executive committee in a club. President -The club president serves as the executive committee chair. Immediate past president(IPP) – IPP provides advice and guidance as requested by the club president. what is toastmasters executive committee? The Toastmasters EC committee is all about passionate Toastmasters. Some are here for communication. Some are here to be leaders. Some become excellent at both. Leadership is a ladder that can be climbed only with will, belief and a vision. Do you see yourself up on the Ladder? Are you worried about the path? The journey will be magical but definitely worth volunteering. 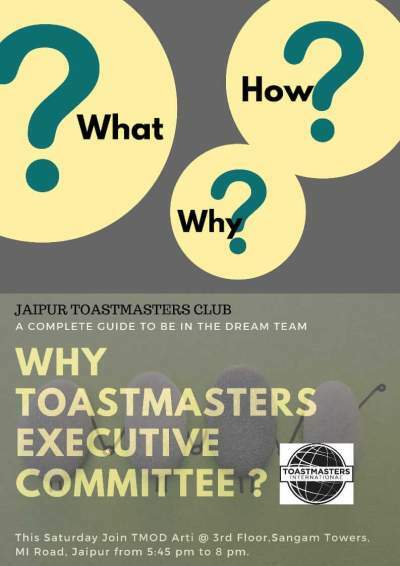 This Saturday at Jaipur toastmasters club, let’s decode the what is toastmasters executive committee? how does it work? why do we need?